In addition to its usual array of old Land Cruisers and Land Rover Defenders, my old money ‘hood occasionally produces something really cool. This is that. 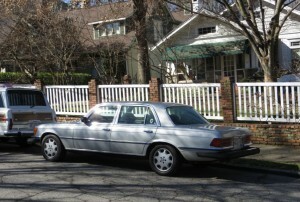 Shown above (and below, which, admittedly, is odd) is a Mercedes 450SEL 6.9, which debuted in the mid-1970s as a predecessor to virtually every normal sedan with a huge engine offered today. (Think BMW M5.) Actually, that isn’t strictly true: the 450SEL 6.9 was technically the successor to the hot sedan that started everything, the 300SEL 6.3. But some might argue that the 6.9 is cooler. To make the 6.9, Mercedes took its typical long-wheelbase S-Class sedan and added a 6.9-liter V8 that made 286hp and 405 pound-feet of torque. US models had less, at 250hp and 360 lb-ft. These numbers may seem small, but keep in mind that the base-level Corvette of the day had – this is true – 165 horses. Even the Stingray didn’t top 200. By comparison, today’s ‘Vette makes 400 horses. So the same proportional increase (51.5%) would mean an S-Class with 604 hp. Which is exactly how much power the range-topping S65 AMG has. Coincidence? Hmm. In addition to 6.9’s big motor, Mercedes also added self-leveling hydropneumatic suspension of a similar design to those odd-looking 1960s Citroens. At the time, this was very cool. Now, it makes these cars a pariah on the used market since even minor work costs as much as a C-Class. But back then, no one cared about the problematic future of the SEL’s suspension – especially Claude Lelouch. Lelouch was a filmmaker who created the famous “C’etait un Rendezvous,” which shows him speeding through Paris in the early morning, running red lights, driving at excess speeds and frequently going the wrong way. His car of choice? A 450SEL 6.9 – though he dubbed a Ferrari’s soundtrack over the Benz’s engine note for the final cut. 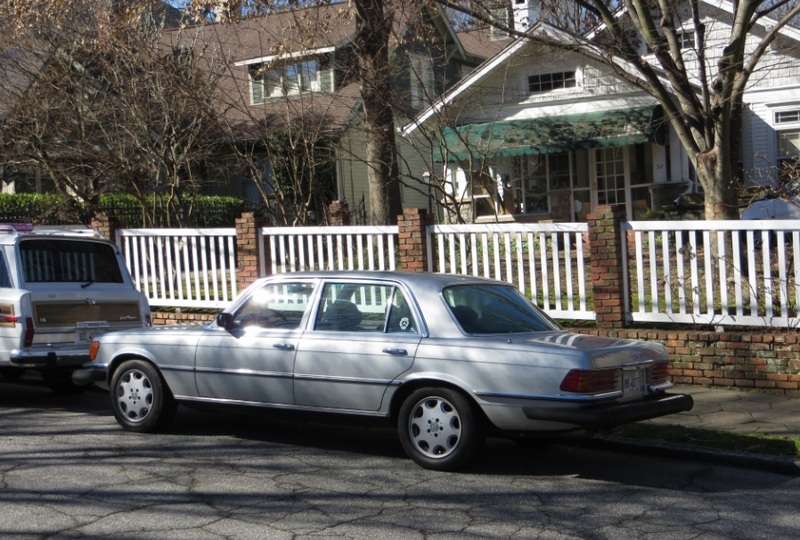 Of course, by today’s standards, the SEL 6.9 is positively outdated – even with these later SL-Class wheels added by my neighbor. But it should still hold a special place in the heart of anyone who’s ever lusted after an AMG Mercedes. I’m digging the Grand Wagoneer in front of it. Did you actually drive the 6.9? I’ve never driven a 6.9, but I’m thinking that if I bought one, I would regret not buying a C63 or S63 AMG instead with the M156 motor. Though at the end of day with these thoughts, I’m clearly contemplating ways to flush serious money down the drain. C’etait un Rendezvous is an awesome video. You shoulda provided a link, cause it’s hard to find.. I have an SLK AMG, and I have some serious lust for the C63… except I really like drop-tops. Sue me. But the 63 sounds like such an obnoxious hooligan…take of the badges and most people have no idea what they’re up against. If I could have trade the SLK for a boxster S and get a C63 as my “daily” driver, I think I’d be in heaven. Fairly sure I heard that as well, although I wasn’t too keen on what I’ve seen of the next-gen C class I liked the chiseled elegance of the last few years. I was also I think in the minority who thinks the E-Class facelift looks…soft. I really liked the E-Class…especially the 2012 E63. OK, I’m officially old since I’ve been a car nut since the 1950s. Fast Detroit cars like late ’60s Muscle and Pony cars made a huge amount of noise, and slewed around all over the place due to massive low-end torque, primitive suspension and bad tires when they accelerated. My pal got an amazing job back in 1972. He became the chauffeur for a family who eventually parlayed a small grocery chain into a multi-billion dollar empire. Lasted right through until his retirement a half dozen years ago, so they trusted him implicitly. Here’s the thing, they lived in a rural area, a small town, where they grew up. After he got them to replace the barge like black Chrysler for a 450 SEL in 1974, things looked up. Got to drive that, very nice compared to my Audi 100LS. Then about 1978, he got them to buy the 6.9. Well, that was something, all right. Instead of sturm and drang whiz bang tire-shredding Detroit style acceleration, that thing just went, with a gentle sound track of what sounded like a small engine winding up. I drove it several times, and the only problem was how rapidly you found yourself going. It had just a three speed auto. Full acceleration gave 110kph in low, 170 in second and then whatever more you wanted before fear set in concerning getting round the next curve on two lane country roads, which both he and I knew well. It felt like a rocketship, although when I read old reviews, it apparently wasn’t. Nevertheless, nobody ever gave my friend much trouble, probably because it had a high top speed and the best tires along with its 230 klick ability. Quite the chariot for my pal, a Mercedes fanboi to this day. Even got his employers to open up a Benz dealership locally, so he didn’t have a 3 hour round trip to the city to change the oil. GREAT post! I was hoping someone would chime in with firsthand knowledge. Yes: the 3-speed auto seems like it would cause a problem. Glad to hear the car was otherwise pretty damn good.